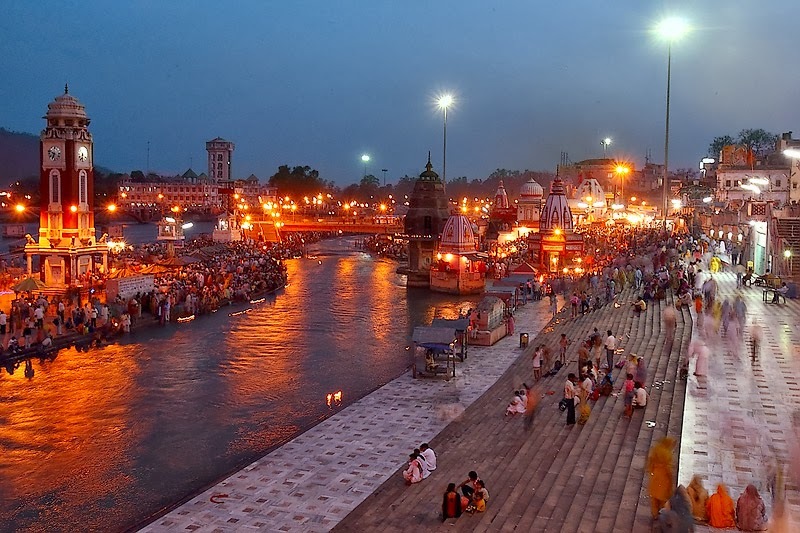 Har Ki Pauri is a famous ghat on the banks of the Ganges in Haridwar in Uttarakhand state in India. This revered place is the major landmark of the holy city of Haridwar. Literally, "Har" means "Lord Shiva" who is the god according to shaivite school of Hindu theology, "ki" means "of" and "pauri" means "steps". Lord Shiva and Lord Vishnu are believed to have visited the Brahmakund in Har ki Paudi in the Vedic times. There is a large footprint said to belong to Lord Vishnu on a stone wall. It is believed that it is precise spot where the Ganges leaves the mountains and enters the plains. The ghat is on the west bank of Ganges canal through which the Ganges is diverted just to the north. Har ki pauri is also the area where thousands of pilgrims converge and the festivities commence during the Kumbha Mela, which takes place every twelve years, and the Ardh Kumbh Mela, which takes place every six years and the Punjabi festival of Vaisakhi,a harvest festival occurring every year in the month of April .